Have you ever tweak your photo to see how will you look if you're thinner? Then did you find resemblance to someone? 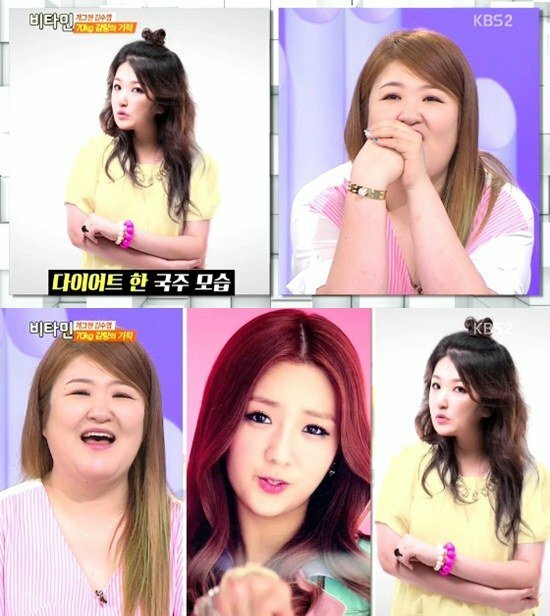 For DJ and comedian Lee Gook Joo, she might didn't expect it but a thinner version of her resembles APink's Bomi. On today's episode of KBS 2TV 'Vitamin', they talk about the successful diet of talked Soo Young Kim. Lee Gook Ju comments "I have to also since I'll be wearing wedding dress when I get married. Thus, an edited after-diet photo of Gook Ju is flashed and mMCs comment that she has a strong resemblance with APink's Bomi.